Elegant kaftans have always been a popular option for evening wear in the Middle East, and often feature in runway collections by designers like Christian Dior and Oscar de la Renta. One company aiming to make kaftans more accessible in Europe and the USA is Mohajababes. They've just launched their Autumn/Winter collection and I'm certainly a fan of their designs; read on to find out more about how they started their business. Jana: Tell us a little about yourselves and how you came to start Mohajababes? 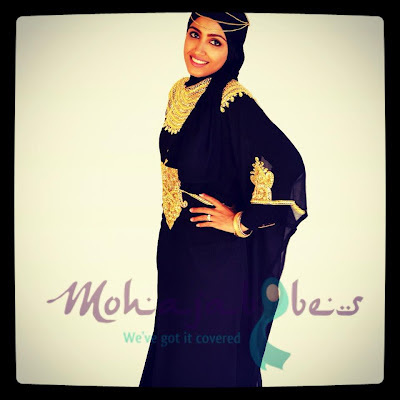 MJB: Mohajababes was launched in November 2011 by two sisters based in California and London. After three years of being asked where we got our outfits from every time we were at weddings or parties in the UK or US, we recognized that there was a gap in the market for beautifully handmade, modest kaftan dresses and we began sourcing beautiful kaftans in a variety of colours and designs, each hand embroidered with beads, sequins and jewels. We wanted to bring kaftans to the US, Canada, the UK and Europe so Muslim women would have other options for evening wear. You'd either see women in traditional outfits or about five or six women in identical dresses that you knew they got from Monsoon and buying a Mohajababes kaftan means you have a different option and know you’ll be wearing a garment you can feel special in and genuinely be the only one at a party dressed that way! Jana: What's special about your kaftans? MJB: We do take into consideration current fashion trends but ensure our kaftans adhere to what our customers love about them so much - that you can dress them up or down, that they are suitable for hijab wearers and non-hijab wearers and that they are unique and one one-off pieces. We love working with high quality chiffon - this falls beautifully on the body, is an incredibly forgiving fabric and is easy to dry clean. We love working with colours that are your classics: blacks, reds and deep purples, but we push the boat out and have got people buying royal blue, yellow, teal and turquoise kaftans too. Our colour choices change depending on the season, so we've had a lot of bright colours for our Spring/Summer collection, but are bringing in more muted colours for Autumn/Winter. Most importantly, we make sure our pieces are affordable which we know our customers really appreciate. Jana: Kaftans are stand-out pieces on their own; how do you like to style yours? MJB: We like to keep it simple and let the kaftan stand out! Always a plain hijab or fairly simple hairstyle (if you don't wear hijab), no necklaces because the embroidery is usually concentrated up top. Bracelets and rings are coordinated to match the kaftan colour and beading. You can dress the kaftan up or down by adding on a headband to the hijab or a jewelled brooch (which we sell too), or just keep it plain and simple and let the kaftan do all the work! Jana: What's your personal favourite from the current collection? MJB: Our favourite piece from the new collection is the long sleeved Jewelled Waterfall our newest style with pearl-like beading - it's not something we've had before; it is gorgeous, flatters the neck and shoulders beautifully and comes in stunning colours - perfect for all those winter weddings! 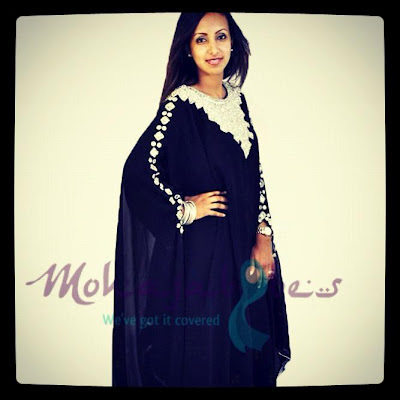 You can view and purchase the new collection of Mohajababes kaftans, scarves and accessories from their website. Let us know what you think of their designs! These kaftans are gorgeous. I love the modest aesthetic in these for evening wear. Not everyone is into strapless tiny dresses! They are elegantly simple and intricate in the details at the same time. Wonderful interview, thanks for posting.